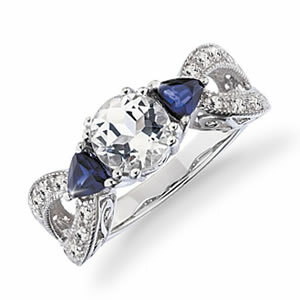 Master Jeweler Thomas Sota has created a stunning three stone engagement ring with a 1 ½ Carat round sparkling White Topaz center adorned with ½ Carat of deep Blue created trillion-cut Sapphires. The graceful split shoulder is also accented in White Topaz with lovely detailed engraving. A wedding ring fit for a Queen!